Just a little update as to my absence over the past week and a bit. I got it into my head that I wanted to add to my big kit. 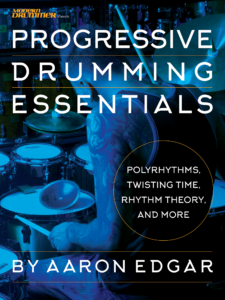 Which put a slight speed bump in finishing Polyrhythms Part 6, but I think it will be worth the wait for you guys! I’m also excited to announce that after over a decade of playing Eliminators, Demon Drives and the ICON Rack products from Pearl I’m hopping on board as an endorser! As for modding the big kit, I started entirely from scratch on this as I wanted to put my 26×22″ bass drum on the right hand side of my kit. Which, unfortunate for me required my rack to be moved 4″ to the left. Which of course required me to remove EVERYTHING from it. Yup, FML. Anyway, I got it up and running for the most part right now. With a few new ideas. I planned in the future to get an SQ2 XRay acrylic kit for maybe a full blown DVD next year or the following and I had some ideas (still hush hush for the most part) One of which however was to float four snare drums across my left side and abandon traditional hihat position since I rarely use it on my large kit any way. Some of the new things you can look forward to seeing on this kit are my “Hell Stack” which is a 21″ and 24″ Hammerax HellBell stacked. It sounds AMAZING. More bass drums, more snare drums, more awesome! The drums are as follows in SQ2 Beech Vintage with exception of the snare drums. Keep hitting EVERYTHING! Drums, Cymbals… Idiots! Premium Videos $2.25 until Saturday night only!